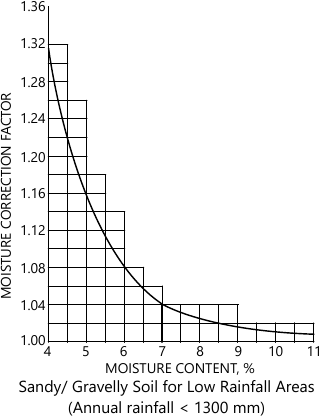 3 (b) Show that the design thickness of a concrete pavement slab is safe for combined laod and temperature stresses for edge loading conditions given the following data. 4 (a) Speed and delay studies are conducted on a stretxch of road measuring 4 km in NS direction. Form this data determine Journey speed anad running speed of traffic stream in either direction. Determine average values of volume too. 5 (a) Benkelman beam deflection studies were carried out on a highway pavement with 50 mm thick bituminous surface course, when the mean pavement surface temperature was 40°C and the field moisture content of subgrade soil was 5.5%. The soil is found to be sandy and the annual rainfall of the region is 950 mm. The characteristic deflection value of the selected sub stretch is found to be 1.32 mm. Determine the corrected deflection value after appling the corrections for temperature and variation in subgrade moisture.